Starting with his participation at the CBS Graduation Ceremony in late August 2017 and his first student mentoring meeting in FinanceLab in connection with the kick-off event in September 2017, Thomas Borgen’s engagement with CBS has manifested itself on a number of occasions during the academic year. 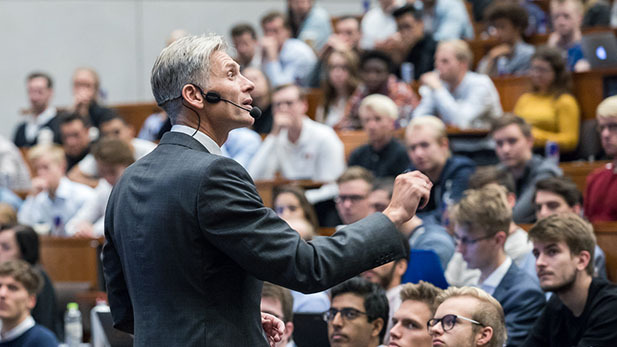 In November 2017, the Danske Bank CEO participated in CBS Impact Day, an event targeting students, alumni, faculty, practitioners, politicians and media. In March 2018 he hosted two mentoring sessions in Danske Bank’s headquarters on Holmens Kanal, one with ten of CBS’ full-time MBA students followed by one with six students from the student organization FinanceLab. A few days later, at CBS’ Annual Celebration, he led a happening, offering DKK 1 million a year for five years towards an endowed professorship if guests from other corporations and organisations would band together to match this. The challenge was accepted by CEO Thomas Woldbye from CPH Airport and Chairman of the Board Torben Möger Pedersen from the Danish Society for Education and Business, each pledging DKK ½ million a year for five years. April and May 2018 saw the two closing events of Thomas Borgen’s academic year as CBS’ first Executive in Residence, both 'A Day at CBS'. Here he met with faculty from the Departments of Finance, Organization and Digitalization, visited the new Student & Innovation House and the Copenhagen School of Entrepreneurship, visited CBS’ case teams and shared what he got out of the year with CBS’ Senior Management Group and Board. What did Danske Bank get out of your year as Executive in Residence? For me and for Danske Bank my year as Executive in Residence was about getting closer to CBS, to get insight about current research ideas at CBS and to get new contacts and sow the seed for future collaboration and alliances. Each year we recruit about 2500 new employees – many of them from CBS – and learning how we can be more relevant to you and the other way around is valuable to all of us. In addition, we think that mutual exchange and get-togethers between students and businesses is vital in terms of securing future growth and competitiveness in society. What did you get out of your year as Executive in Residence – personally? To meet with students face to face and hearing their perspectives, their questions, opinions and learning more about their values were really exciting and inspiring. Getting to know them is a chance to get a glimpse into the mind-set of our future employees, shareholders and stakeholders and to learn more about how young people today view the world and the main challenges ahead. I was equally inspired by the competent and enthusiastic faculty members that I met. They impressed me with their thinking and insights. What did you get out of your year as Executive in Residence – professionally? As a society we need education and we need relevant education, and for Danske Bank getting closer to universities and business schools is a chance for us to learn how to become more relevant to students and maybe inspire both students and schools in terms of the qualifications and research areas we see as most interesting. What was your most fun experience during your year as CBS’ Executive in Residence? The greatest thing about being back in school was – well exactly that. Maybe the students weren’t fooled but personally it felt a little bit like being young again. On a more serious note, I had a lot of fun and interesting experiences at CBS and it is difficult to name one, but I particularly enjoyed the opportunities I had to interact with smaller groups of students. I was impressed with the enthusiasm, the ideas and the level of ambition I met. What surprised you the most about CBS? We tend to frame school versus work as theory versus practise or academia versus real life. But as the real life-representative it struck me that students were very much in touch with current trends and realities. They had profoundly fresh and inspiring perspectives on many of the issues we discussed. I don’t know if I was surprised, but I was pleased to see how international CBS is – both in terms of the students and staff it attracts and its mindset. That is extremely important for all of us. Do you have anything you would like to say to CBS’ students? Being a student at CBS you have already had a head start in life, and as you are about to find out life is full of opportunities. If you dare to reach for them. Your education is shaping how you think and how you view the world and it is giving you answers to many of the questions facing businesses and societies today. Your qualifications can be enormously valuable for companies and for society at large. But society is changing rapidly and your current answers may be outdated tomorrow. Your best chance of success is to remain curious and open-minded and to focus less on the answers you already have and more on the questions that no one is asking. What, in your opinion, is CBS’ biggest challenge moving forward? CBS alongside other leading universities and research institutions are not only on the front line in terms of identifying and picking up new trends and developments. Research, new ideas and insights that will shape the world of tomorrow is hatched and nurtured on your very campus. And the challenge facing CBS – like most businesses and institutions – is to adapt your organisation to the new insights and trends that you continually identify. Organisational change can be slow – but the world is moving fast.